I have a video on this, if needed. Hi Rob and welcome to the MTC support forum. There may be more used Zing/Zing Airs for sale once people start getting the Force. However, as you note - its distribution is "pending" somewhat. If you think the Force is better suited for your needs, you can contact Chad at KNKUSA to see when he hopes to have it out to end users with the software. So sorry to hear this. My condolences to your family. Re: What a day! Update!!! Good morning @ladybird. I have been on this forum pretty much since the beginning and have never seen or heard of a PM (private message) being seen by the whole country (or world!). It is safe to send your address through a pm. Having one child makes you a parent. Having two makes you a referee. 24" Mats and Red Blade Holders now available for the Zing! I have been waiting for these! Also, to those who have been waiting, the red blade holders are now back in stock. 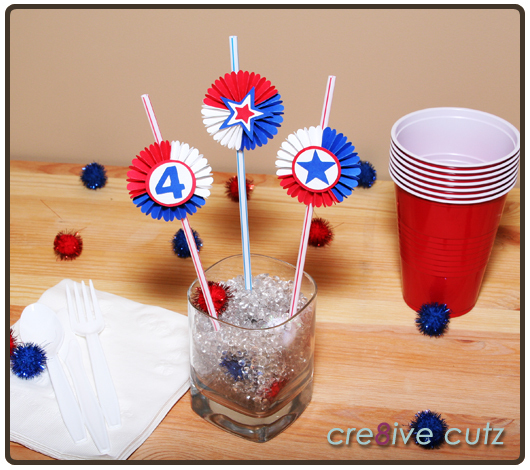 If you're looking for something festive to dress up your 4th of July picnic table next week, how about these cute straw toppers? You can use them as a centerpiece then each guest can pick their own unique straw to help them keep track of their drink! I have more pics and instructions on my blog if you want to see how they're made.